"What kind of experience and research do you have specific to my industry?" Our team members have decades of experience in supply chain, and have completed successful engagements with satisfied customers across a broad range of industries including Aerospace, Automotive, Chemicals, Consumer Goods, Defense, High Tech, Industrial Products, Logistics, Food & Beverage, Pharmaceuticals, and Retail. Enterprises in different industries can have more in common than those within an industry. For example, as shown in the graphic below, capital-intensive companies can often learn more from capital-intensive companies in other industries than from “asset-less” companies in their own industry. 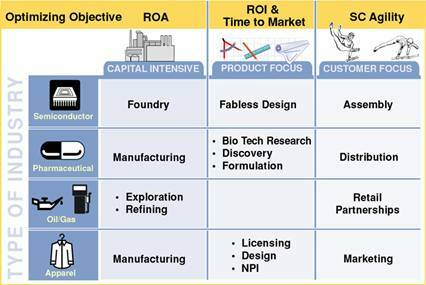 The same may be true of R&D-focused enterprises across different industries. When looking at business models simply at an industry level, it is easy to miss what is happening across the network! Focusing at an industry level such as high-tech, semi-conductor or apparel does not reflect the effort undertaken by firms to create differentiation in their products and services, nor does it take into account their position in the end-to-end supply chain. Firms define their markets differently, and they define processes and services uniquely to their market. Separating core from context. The above perspective does not discount the value of in-depth industry knowledge in any way. On the contrary, as you analyze your business competency to determine which processes you keep within and which is outsourced, it is that intimate knowledge of your industry that helps make the “core vs. context” decision. You want the best of both worlds. Taken together, you can achieve the right balance of your own industry knowledge with new, creative models from other industries to develop a successful supply chain strategy for setting up and managing the links with your trading partners. Each supply chain is unique. Ultimately, you need to look for the RIGHT set of guiding principles — especially if you are examining your end-to-end supply chain strategy — to determine what’s appropriate for YOU. New ideas and fresh thinking are more likely to come from external sources than internal sources. Therefore, if you are seeking new models in Supply Chain Management, you are likely to be better served by looking across industry segments to find new ideas and insights.